Ref. 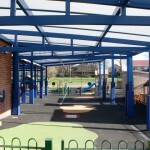 Fred Longworth Barrel Vault Canopy. 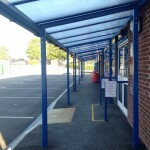 Can I just express my sincere gratitude concerning the recent installation of our new canopy to the rear of our school. 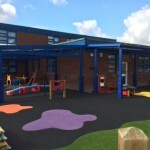 What a pleasant experience I have had dealing with Twinfix, especially your design team, ground workers and installation team. 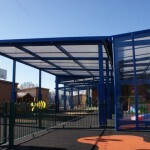 The professionalism shown from the first phone call enquiry through to completion is without question unrivalled by any contractor I have dealt with in my 20 years’ experience of Facilities Management. The people who I have spoken to and dealt with that I have made my experience dealing with Twinfix so pleasurable and memorable are an absolute credit to you and your company. 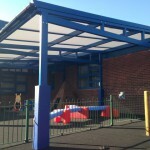 I have already made enquiries to have our new canopy extended. There really is no need to shop anywhere else. 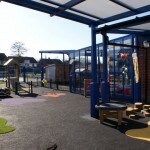 Would you please take the time out of your busy schedule and personally thank on my behalf all involved in this project. 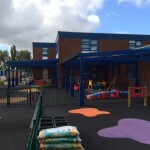 The initial project involved fitting a 35m long 2m wide walkway on this school, and another 32m walkway at the adjacent school on the site, both designed to provide under cover access between car drop-off and the school buildings. 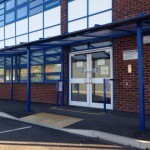 Twinfix were approached by main contractor ISG Construction Ltd from Salford to design, manufacture and install these as part of their overall task to refurbish the old Woolston High School campus ready for a rather different life. 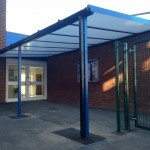 Once Green Lane School was up and running Head Teacher Paul King asked Twinfix to quote for a canopy for their second entrance and for three covered areas to be installed adjacent to neighbouring classrooms. 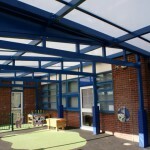 Once these were fitted the school staff were so delighted with them that they wanted more! The next phase involved Twinfix sales working very closely with Paul King and his team in order to make the most of the available space. 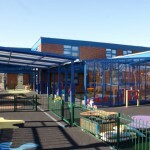 The result was that two of the three classroom canopies were extended and a fourth was installed. 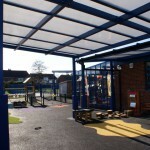 Taking the advice of Twinfix salesman Nick Featherstone, they also ordered a vertical screen to run along the open side of one of the earlier canopies in order to provide weather protection. 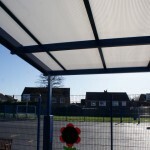 Manufactured with 6mm solid polycarbonate, which is virtually unbreakable, this glazed panel has since gained full approval from the staff who work in this space, as they had previously found this area to be a bit of a wind tunnel. 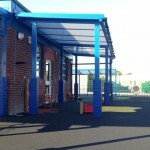 All the canopies have aluminium frames powder coated in blue RAL 5010. As this metal doesn’t rust in use they will keep their good looks throughout their long life. 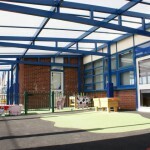 The roof glazing consists of Twinfix Multi-Link-Panels NF fitted with tough 25mm opal multiwall polycarbonate. 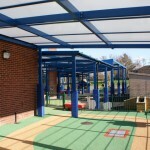 The NF denotes that these panels conform to the HSE’s recommended drop test ACR[M]001:2014, as recommended by HSG33. 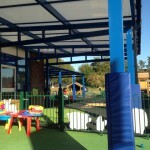 Protective foam pads were fitted to each supporting post to guard the children from bumps and bangs. 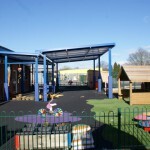 Soft play surfaces (by others) finished off each area. Twinfix are particularly proud of the way they prepare post foundations. They make and fill the holes in the usual way, calculating the required cubic footage required for each post, and the backfill them so that the ground is level again – and safe to use. They then leave the site for several days to allow the concrete to set before returning to remove the backfill and install the canopies on solid foundations. 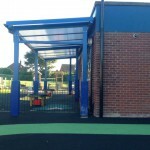 This process extends the total installation time a little, but it does ensure that each canopy is permanently and safely anchored to the ground! 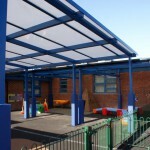 No need to get wet while entering school!